Military bulldozers and tractors moved to remove roadblocks erected by protesters near the headquarters but were forced back by protesters, according to eyewitnesses. "The RSF and army forces claim they seek to remove the roadblocks to clean the area but the protesters refuse," a demonstrator tasked with protecting the camp, who preferred to remain unnamed, told Anadolu Agency. The protesters, numbering about 5,000 with more arriving, chanted "Freedom, freedom" and "Revolution, revolution," and appealed to the army to protect them, Reuters reported. "We appeal to all to move immediately to the protest camp to protect the revolution and its gains," it said in a statement. 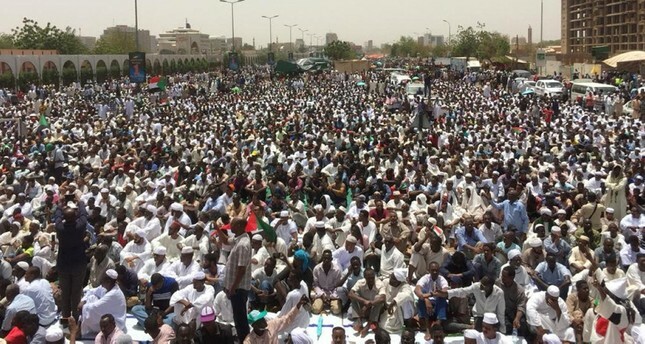 On Thursday, Sudan's army announced that it had removed and detained Bashir and was setting up a transitional military council to run the country. The SPA said the resulting transitional government and the armed forces must bring to justice both Bashir and officials from his feared National Intelligence and Security Service (NISS). "This must be done credibly and swiftly, with protest leaders, political opposition, civil society organizations, and all relevant elements of society, including women." Protest leaders have called for the feared intelligence agency, whose chief Salah Gosh resigned on Saturday, to be restructured and for NISS officials to face prosecution. The SPA also demanded the confiscation of properties belonging to al-Bashir's National Congress Party and the release of soldiers who sided with their "revolution."